“I was just here this past weekend (on 7/29/17) and had an amazing experience. If you like spas and getting pampered than this is the place for you! I went as part of my bachelorette weekend in the city and wanted to relax and pamper myself. I booked appointments for a group of friends celebrating with me. Originally I booked for a larger number but the staff (Kathy you are great!!!!) accommodated the changes with my reservation. When making all the appointments and checking in I was met with friendly and fast service. I felt welcomed and didn’t worry about anything. I had gotten their spa package of a 60-minute signature massage and scrub for my arms and legs and then did a 30-minute express facial. My massage was great I felt so relaxed and comfortable that I had dozed off for a little bit. All of my worries and stress melted away. I enjoyed chatting with my therapist (I forgot her name) while she worked out my tensions and she gave me advice on how to avoid stressing out my shoulders for the future. I loved the scrub afterwards – you can choose a scent (I recommend strawberries and champagne) and my skin was never softer. 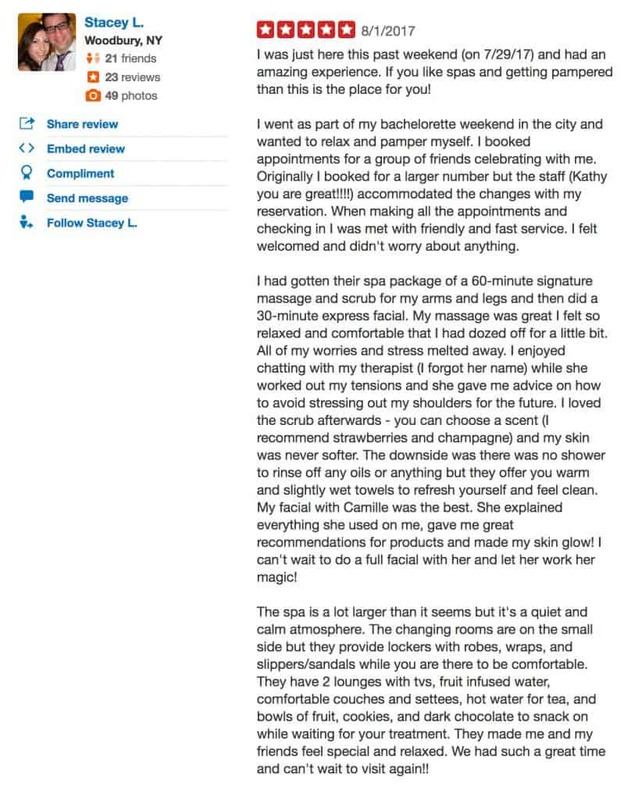 The downside was there was no shower to rinse off any oils or anything but they offer you warm and slightly wet towels to refresh yourself and feel clean. My facial with Camille was the best. She explained everything she used on me, gave me great recommendations for products and made my skin glow! I can’t wait to do a full facial with her and let her work her magic!